As a seller, are you responsive? Think carefully about this question. Do you know exactly how long it takes you to respond to email and phone calls from prospective clients? How quickly are you responding to leads that come from the marketing department? Do you respond at all? How often do you have to say someone, “I’ll get back to you.”, because you did not know the answer to their question? What about your proposal creation and delivery time? Do you respond within an hour or two, or is it more like days? In today’s fast-paced, competitive business world, it is all about velocity. It might come as a big surprise to many sellers to find out that they are slowing down the purchasing decision a buyer needs to make. I imagine right now some of you are saying, heck no, I don’t slow the process down, buyers move slowly. In truth, many salespeople are their own worst enemy. If you sell, you have one job to do. Contrary to what you might think, it isn’t to sell something. Sales acceleration is big business. In 2013, companies spent $12.8 billion dollars on sales acceleration technology. By 2017, that number could be as much as $30 billion according to a research report by InsideSales.com. Huge investments are being made in technology, which conceivably should improve performance. The problem is that it isn’t working. Technology might deliver a lead faster to a sales rep, but if they don’t respond quickly, what’s the point? Or, you can have web forms established to encourage people to sign up for demo’s of your product, but if you don’t contact someone immediately once they do, the buyer moves on. As an example, as part of the research I’m conducting for a client, I used the web to request a demo of their largest competitors platform. That was 10 days ago and not a peep from anyone. I specifically said, “I was representing a client who had an interest in purchasing a solution like what they offered.” Crickets. In fairness to the salespeople at the company, there is no way to know what the internal process is for moving a web inquiry for a product demo over to the sales team for follow up. What I do know is that by the time they get around to contacting someone, if they ever do, the opportunity is missed. At team and individual levels, sales response time needs to be evaluated carefully. Selling and knowledge skills need to be examined as well. Every time a salesperson talks to a prospect or a customer considering another purchase, they must be able to answer questions in the moment. Sales acceleration is not only about moving more quickly, it is also means working smarter. That’s where mobile, the Internet and social networks come into play. You need to be able to access and gather real-time sales intelligence from LinkedIn, Twitter, the web, InsideView or Owler. When you are reaching out to prospects, you need to have something relevant to talk about beyond today’s weather. When I’m talking to a prospective client, I can answer their questions immediately, even if it means quickly going online to source what I need. If you are a field salesperson, how often do you ask yourself if you really need to meet with everyone face-to-face? At least initially. How often do you use the phone or web conferencing to shorten the sales cycle? Buyers are busy. They will appreciate that you are saving them precious time. Integrating virtual strategies into your sales process also means that you can talk to more people each and every day. Stop dragging out the sale. I want to suggest to anyone reading this post that they challenge themselves to move faster and work smarter. Technology can only take sales acceleration so far. Sales remains a people business. Your ability to respond more quickly than your competitors, as well as being prepared to answer any and all questions that can move the buying decision forward… well, my friends, that’s how deals are won! I read an interesting New York Times article about sales challenges that Yesware was having throughout 2013. It seems that though the start-up had amassed some 100,000 free users, their newly hired, ten person sales team wasn’t successfully converting those users to paying customers. It is an intriguing story that I encourage you read. Also read what the CEO, Matthew Bellows did to solve the problem. As I read the article, what got me thinking was – pardon the pun – a problem for most sellers today is that they’ve been trained to sell features, not sell the problem that their product or service solves. This is an issue for marketing teams also. Website copy is littered with features, benefits and buzz phrases. Rarely can you tell what problem is being solved. I’m not suggesting that the inability to “sell the problem” was Yesware’s issue, because I don’t have that personal insight. It wouldn’t surprise me if this were part of the issue though. I see it as a common challenge among technology companies. They are so wrapped up in the lipstick and what’s under the hood, they cannot stop talking about what their product does. What they need to do is talk about the problem it solves! That your buyer has clearly defined the problem they want to solve. That you can clearly connect the dots between the buyers’ problem and your offering. So, first comes understanding what problem your product or service solves. Hint – it isn’t the features. Then the job is to clearly articulate your problem solving message in every communication. Given the common practice is to mass email people, the wise seller takes time to think about how the message is perceived by the person receiving it. Think of three problems your product or service solves. Craft three email messages that speaks to each. Create three target lists with the type of buyer that might have one of those three problems. Send the right message to the right prospect. What have you got to lose? More spam isn’t the answer. Better sales messages focused on problem solving is the better way to go. To illustrate my point, here is a snippet of another sales pitch I received through LinkedIn InMail. Uses buzz words. This assumes that your target buyer gets what you are talking about. I know what PPC means – pay per click – but don’t be quick to assume that will be the case for everyone. Calls me a group. I’m a person. Do I need to say more? OK, I don’t have time to focus on testing new landing pages. What problem do you solve for me beyond the obvious that you save me time? Now he gets closer to telling me what problem their service solves…my AdWords performance might – double. Let’s say for argument’s sake that they do double my AdWords performance, what problem is that solving for me? Will more eyeballs on my ads increase revenue? Frankly, I don’t care how many people see my ad, but if you tell me that your service helps convert views to paid customers, now I’m listening. He doesn’t even know if I use AdWords, and if I don’t, maybe he should tell me what problem I’m creating for myself by not doing so. Don’t make your job the buyer’s job. My point is that – as the potential buyer – I’m left to figure it out. Do you really think prospects will take the time? This is probably one of the biggest gripes I have about sales communication today. Broadcast emails that use a feature selling versus problem selling approach. Mass emails are easier to send. I get it. You might even have marginal success, but in general, this approach is such a waste of your precious selling time. If you want different results, try something different. Then come back and tell me how you are doing! Blogging can be a lonely endeavor. Well, until you attain status the likes of Guy Kawasaki, Jill Konrath, Jonathan Farrington or Chris Brogan perhaps. Writing has always been a passion of mine. Most likely the fire of that passion was ignited by my obsessive addiction to reading. Yes, I was reading books long before Kindle came along. I remember sitting at the breakfast table reading every word on the cereal box. My desire to read and learn everything I could about almost any subject – I’ll skip math and physics, thank you – has served me well throughout my life and business career. It still does! As a salesperson, the ability to converse with people on any number of topics is a sure way to connect and bond with them, except if you veer into the murky and dangerous waters of discussing touchy subjects like politics or religion, which I don’t. I became aware of blogging around 2001. At the time, I couldn’t really fathom why people would essentially want to put their most intimate musings online for the world to see. Think old fashioned diary with lock and key, or a journal you keep hidden away in your nightstand. I saw no purpose in exposing myself that way. Fast forward to around 2008…. that’s when I began to realize that blogging for business was one way to extend the power of your personal and professional brand. After a few fits and starts, I finally got my blogging groove on. Initially, I struggled with finding my voice. I was worried. Would I be too controversial? What would potential customers think? Was it possible I might lose business because of something I said? Like many of you, I had the exact same fears about putting my ideas and opinions out there. And then… I just got over it. I decided that I wanted to write about those things in the world of sales, which includes social selling, business, management, customer experience, technology and marketing that I believed in or disagreed with. Occasionally, I mix in musings about life. The point is that my blog is the place where I can share what I think matters and it tells people about me. If a company chooses not to hire me, so be it. I am not right for them anyway. As I said though, blogging can sometimes feel like you are talking to yourself. I know hundreds of people who follow and read my blog, which is so cool. And yet, they almost never post a comment. I see the number of times my posts are shared via social networks, but then again, mostly crickets when it comes to comments. A few of my posts have pushed some buttons and that generated comments. I even chuckle when I receive email from people who tell me they love something I’ve written about and why it mattered to them. All the while I’m screaming silently in my head…please post your comment on my blog! What I’ve come to appreciate it is that it is OK if people don’t comment on the blog. Maybe they, like I was, are nervous about how they will be perceived, but the fact that they follow my words is quite a compliment. I’m thrilled that they share, tell their friends, send me email and even hire me/my company as a result of reading what I’ve written. Frankly, can it get any better? On Tuesday, Top Sales World Announced the Top 50 Blogs, and I’m swelled with pride to say that my blog made the cut for the 2nd year in a row. This isn’t one of those vanity lists you see so often today. The folks at Top Sales World actually hire a research firm to vet the top 50 out of about 100 sales and marketing blogs on the web. You can review the criteria and see the entire Top 50 list here. 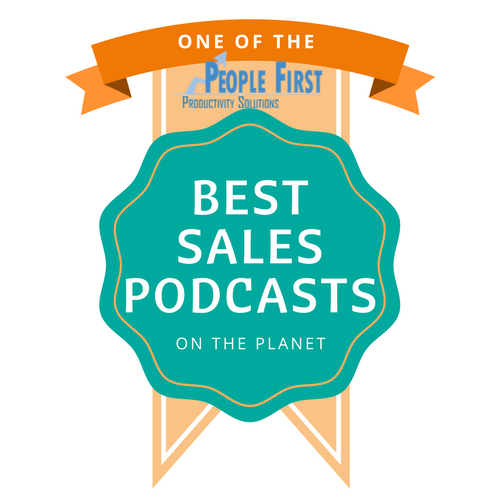 Thank you, Top Sales World! Your recognition of my work means more than I can say! 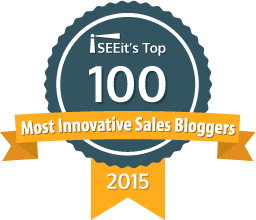 I found out yesterday that Docurated named my blog one of the Top 52 blogs on Sales Efficiency. WOW – blog recognition twice in one week. I suppose it just goes to show that people do read what I write and often believe I have something of value to say. Thank you, Docurated. Find the entire list of their blog choices here. I blog because I believe in the power of learning and sharing ideas. Maybe hundreds don’t flock to my blog each day to comment, but I know it is being read and that’s A-OK by me!